Excitement and intrigue follow you closely wherever you go! Just a little painting practice in Photoshop, with a random subject. 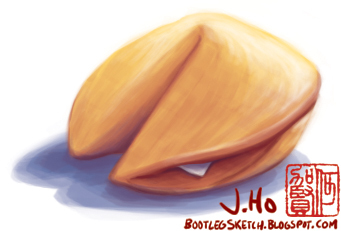 I looked at a fortune cookie for reference, but this isn’t a depiction of that exact cookie. If that makes any sense. I mean, it makes sense to me, but it might not make sense to you. i have to say it…it looks…almost…like a….oh never mind.